General recommendations and organism-specific therapeutic regimens for osteomyelitis (as shown in the radiograph below) are provided. However, treatment of bone infections can quickly become complicated, and significant morbidity and loss of function can result from failure to treat infections appropriately. It is recommended that consultation with an infectious diseases and orthopedic specialist be obtained to assist in management. Antibiotic therapy for hematogenous osteomyelitis should be pathogen-directed, based on the results of cultures from bone biopsy and/or blood cultures. For osteomyelitis from contiguous spread of infection, wound culture is poorly correlated with bone biopsy culture for all organisms except methicillin-resistant Staphylococcus aureus (MRSA); unless MRSA is grown, surgical bone biopsy is recommended to define the correct pathogen. Orthopedic surgical debridement and drainage is a mainstay of therapy and is necessary to remove sequestrum and prevent chronic osteomyelitis and disease recurrence. For MRSA, a minimum of 8 weeks of antibiotic therapy is recommended. Parenteral therapy or administration of antibiotics with high oral bioavailability is preferred; however, oral therapy at the end of the course can be used, depending on the severity of the disease. For MRSA, new data suggest that organisms with a vancomycin minimum inhibitory concentration (MIC) of 2 µg/mL or greater have a greater rate of treatment failure with vancomycin therapy. In this situation, an alternative agent such as daptomycin should be used. For non-MRSA disease, 4-6 weeks of intravenous (IV) therapy or therapy with drugs with high oral bioavailability is preferred. However, a longer course may be indicated in any type of more complicated disease. Chronic osteomyelitis with multiple recurrences of disease in the same location with the same organism, usually S aureus, may require extensive debridement followed by a prolonged (up to 8 weeks) IV antibiotic course for cure; however, failing this, lifelong suppression may be needed. Treatment of osteomyelitis in conjunction with an infected orthopedic device is complicated and often necessitates surgical resection of the device or a very prolonged course of medication if the device is retained (and sometimes lifelong antibiotic suppression if further surgical manipulation can result in significant morbidity and loss of function). Appropriate consultation with an infectious diseases specialist and an orthopedic surgeon, both with experience in dealing with infected prostheses, is highly recommended. The IDSA guidelines advocate the removal of all hardware if at all possible, with reimplantation of the prosthetic joint after a 6-week course of targeted antimicrobial therapy. During this period, the patient will require an internal cement spacer, an external fixator, or traction to maintain future limb function and joint integrity. For some individuals, this would result in unacceptable morbidity and loss of limb function. In such cases, the orthopedic surgeon may perform a one-stage explantation of the joint and immediate reimplantation of a joint or may perform a simple surgical washout and debridement of infected tissue without any exchange of hardware. 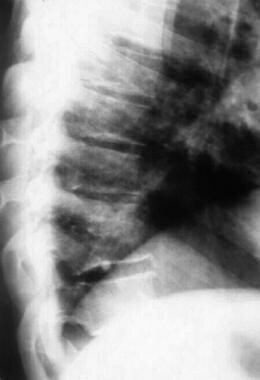 Vertebral osteomyelitis infections involving infected neurosurgical or orthopedic hardware often require a 2- to 8-week course of IV therapy followed by 1-2 years of long-term oral suppression in order to allow the vertebral bones to heal enough so that they will be stable enough for another washout or hardware resection if disease recurs. Owing to the high rates of development of resistance to treatment, rifampin should never be used alone to treat S aureus. Similarly, owing to the risk of development of resistance when there is a high burden of disease, trimethoprim-sulfamethoxazole should not be used as initial therapy alone for S aureus, even when the isolate is sensitive to trimethoprim-sulfamethoxazole; it should only be used after any necessary debridement of disease occurs and at least a 1- to 2-week course of treatment with another antibiotic. Aminoglycosides generally have poor bone penetration and should only be used if all other antibiotic options are unavailable; however, they can theoretically be used synergistically to improve the bactericidal activity of beta-lactam antibiotics, vancomycin, and daptomycin in streptococcal and enterococcal infections, though clinical data are lacking. As with any prolonged course of antibiotic treatment, monitoring for adverse effects is appropriate, and drug level monitoring of vancomycin and, in particular, aminoglycosides is necessary to avoid toxicity and maintain efficacy. The following agents could theoretically be used to treat osteomyelitis caused by MRSA and other gram-positive organisms, though at present, there are no good data on their use. There are more anecdotal reports of ceftaroline and telavancin being used with reportedly good results, but reporting bias could be taking place. In view of their very long half-lives, dalbavancin and oritavancin could be very useful in treating osteomyelitis for a long course, but there currently are no good data to support their use, and therefore these drugs should be used only as a last resort. There are no known data regarding the use of tedizolid for osteomyelitis, though the oral dosing and good bioavailability make this an attractive option that is similar to linezolid but has the same poor side-effect profile. Theoretically, the following antibiotics could be used to treat osteomyelitis when caused by a highly resistant gram-negative organism that is resistant to all other antibiotics; however, they should be used only as a last resort, given that there are absolutely no data regarding efficacy in the treatment of osteomyelitis or the unknown likelihood of adverse effects with long-term administration. Berbari EF, Steckelberg JM, Osmon DR. Osteomyelitis. Bennett JE, Dolin R, Blaser MJ, eds. Mandell, Douglas, and Bennett's Principles and Practice of Infectious Diseases. 8th ed. Philadelphia: Elsevier Saunders; 2015. Vol 1: 1318-27. Tice AD, Hoaglund PA, Shoultz DA. Risk factors and treatment outcomes in osteomyelitis. J Antimicrob Chemother. 2003 May. 51(5):1261-8. [Medline]. [Full Text]. Guglielmo BJ, Luber AD, Paletta D Jr, Jacobs RA. Ceftriaxone therapy for staphylococcal osteomyelitis: a review. Clin Infect Dis. 2000 Jan. 30(1):205-7. [Medline]. [Full Text]. Bouazza N, Pestre V, Jullien V, Curis E, Urien S, Salmon D, et al. Population pharmacokinetics of clindamycin orally and intravenously administered in patients with osteomyelitis. Br J Clin Pharmacol. 2012 Dec. 74(6):971-7. [Medline]. [Full Text]. Rao N, Ziran BH, Lipsky BA. Treating osteomyelitis: antibiotics and surgery. Plast Reconstr Surg. 2011 Jan. 127 Suppl 1:177S-187S. [Medline]. [Guideline] Osmon DR, Berbari EF, Berendt AR, Lew D, Zimmerli W, Steckelberg JM, et al. Diagnosis and management of prosthetic joint infection: clinical practice guidelines by the Infectious Diseases Society of America. Clin Infect Dis. 2013 Jan. 56 (1):e1-e25. [Medline]. [Full Text]. [Guideline] Liu C, Bayer A, Cosgrove SE, Daum RS, Fridkin SK, Gorwitz RJ, et al. Clinical practice guidelines by the infectious diseases society of america for the treatment of methicillin-resistant Staphylococcus aureus infections in adults and children. Clin Infect Dis. 2011 Feb 1. 52 (3):e18-55. [Medline]. [Full Text]. Hatzenbuehler J, Pulling TJ. Diagnosis and management of osteomyelitis. Am Fam Physician. 2011 Nov 1. 84(9):1027-33. [Medline]. [Full Text]. Brinkman MB, Fan K, Shiveley RL, Van Anglen LJ. Successful treatment of polymicrobial calcaneal osteomyelitis with telavancin, rifampin, and meropenem. Ann Pharmacother. 2012 Jun. 46 (6):e15. [Medline]. Jacqueline C, Amador G, Caillon J, Le Mabecque V, Batard E, Miègeville AF, et al. Efficacy of the new cephalosporin ceftaroline in the treatment of experimental methicillin-resistant Staphylococcus aureus acute osteomyelitis. J Antimicrob Chemother. 2010 Aug. 65 (8):1749-52. [Medline]. Jongsma K, Joson J, Heidari A. Ceftaroline in the treatment of concomitant methicillin-resistant and daptomycin-non-susceptible Staphylococcus aureus infective endocarditis and osteomyelitis: case report. J Antimicrob Chemother. 2013 Jun. 68 (6):1444-5. [Medline]. Lin JC, Aung G, Thomas A, Jahng M, Johns S, Fierer J. The use of ceftaroline fosamil in methicillin-resistant Staphylococcus aureus endocarditis and deep-seated MRSA infections: a retrospective case series of 10 patients. J Infect Chemother. 2013 Feb. 19 (1):42-9. [Medline]. Twilla JD, Gelfand MS, Cleveland KO, Usery JB. Telavancin for the treatment of methicillin-resistant Staphylococcus aureus osteomyelitis. J Antimicrob Chemother. 2011 Nov. 66 (11):2675-7. [Medline]. Del Pozo JL, Patel R. Clinical practice. Infection associated with prosthetic joints. N Engl J Med. 2009 Aug 20. 361(8):787-94. [Medline]. [Full Text]. Kishner S, Clevenger SE, Laborde JM. Osteomyelitis. Medscape Drugs & Diseases. Available at http://emedicine.medscape.com/article/1348767-overview. March 1, 2018; Accessed: March 12, 2018. Sia IG, Berbari EF. Infection and musculoskeletal conditions: Osteomyelitis. Best Pract Res Clin Rheumatol. 2006 Dec. 20(6):1065-81. [Medline]. Stengel D, Bauwens K, Sehouli J, Ekkernkamp A, Porzsolt F. Systematic review and meta-analysis of antibiotic therapy for bone and joint infections. Lancet Infect Dis. 2001 Oct. 1(3):175-88. [Medline].